LS and LT models with a standard Direct Injected 3.6L V6 engine deliver 281 horsepower. Get a little more giddyup with dual exhaust in the LTZ model with 288 horsepower. 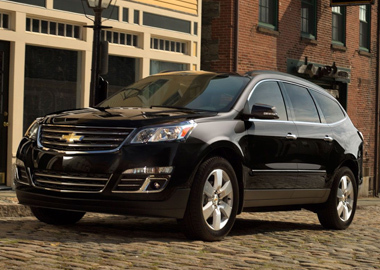 Traverse offers the right amount of power to get you and your family going. Traverse is skillfully designed under the hood as well. An EPA-estimated 17 MPG city/24 highway for FWD models offers up to 520 highway miles per tank. One look at its stylish design and you'll know not all family vehicles have to be boring. Striking taillamps and chrome accents help Traverse turn heads as it drives by. 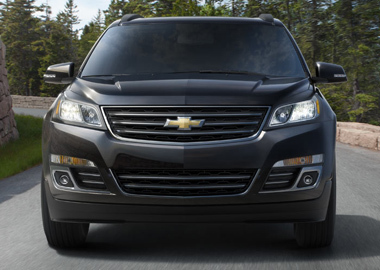 The Traverse LTZ features 20-inch aluminum wheels, dual exhaust outlets and chrome accents. Traverse offers more ways than ever to always keep your favorite music at your fingertips. Stream Pandora® Internet Radio , Stitcher SmartRadio™, or take advantage of the news, sports and entertainment options SiriusXM Satellite Radio† has to offer. Traverse brings you technology at its finest. With the standard 6.5-inch diagonal color touch-screen, your driving experience leaves you feeling fully connected. Chevrolet MyLink puts technology, entertainment and navigation at your fingertips. With touch-screen controls, center stack buttons, steering wheel-mounted controls and available voice commands, you choose how you make phone calls, select radio stations or listen to music. And whether going across town or across country, navigating is a breeze in the midsize SUV Traverse. Use the standard 6.5-inch diagonal color touch-screen to access OnStar® Turn-by-Turn Navigation. From its refined, soft touch materials with accent stitching to the available ambient lighting, which helps set the perfect driving mood – the interior of Traverse will help your family settle in and feel right at home. No matter what shape your life takes, Traverse has the flexibility to go right along with it. 116.3 cu. ft. of cargo space can transform into spacious seating for up to 8† so you can easily switch from carrying your cargo to carrying your precious cargo. The innovative safety features of Traverse help make every road a safe one. Available technologies like an industry-first front-center side-impact air bag, side blind zone alert, rear cross traffic alert, as well as forward collision and lane departure warnings all work together to keep your family safe along the way..
RemoteLink Key Fob Services are a component of the OnStar RemoteLink® app that gives you access to features such as remote start† as well as locking and unlocking – even when miles away from your vehicle. This feature is included for five years after purchase of your 2015 Chevrolet Traverse, with or without a paid OnStar® subscription. With RemoteLink Key Fob Services, you can unlock your automatic door locks remotely if your keys are locked inside or in case of an emergency. With factory-installed and enabled remote start, you can also remotely start or turn off your car, which is helpful for cooling or heating the inside of your vehicle, and activate your vehicle's horns and lights to help locate it in a crowded parking lot.